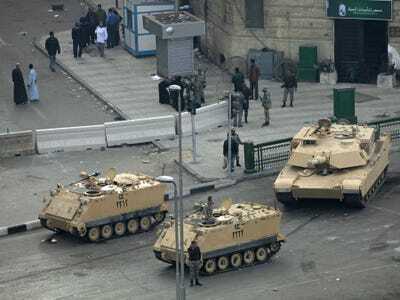 Egypt: What Will The Army Do? That statement tracks rather closely to the commitments Mubarak made in his three previous addresses to the nation. Of course, the military’s statement came before Omar Soleiman announced Mubarak’s resignation and the dissolution of parliament, and the military has not issued any additional communiqués. But it suggests that while the officers may have finally come to the conclusion that their supreme commander had become a burden, at least initially, the military command seems to support Mubarak’s overall approach to returning stability to Egypt. It is uncertain whether Egyptians are willing to accept from the Supreme Military Council what they clearly believed was a Mubarak manipulation. The Egyptian high command now finds itself in an awkward position. Since the dark days following the shattering June 1967 defeat in the war with Israel, they have remained in the barracks. Field Marshal Tantawi, the chief of staff, Lieutenant-General Sami Enan, and their colleagues now must contend with the unfamiliar and difficult world of Egyptian politics. The opposition has demonstrated enormous staying power and unity, but there is a possibility that these disparate groups will split now that Mubarak has relinquished power. How the military–an organisation devoted to stability, order, and the status quo–responds to these challenges will be decisive in shaping Egypt’s future trajectory. American officials should watch carefully how the military approaches the political problem Mubarak left in their collective lap. Will a single military officer rule directly? Will the Supreme Council of the Armed Forces assume a tutelary role? How will they supervise elections? Each of these issues poses potential problems and pitfalls for the officers that could threaten the unity and coherence of the armed forces, which could lead to a non-democratic outcome. So far, Egyptians have put their faith in the fact that the officer corps watched the extraordinary events of the last two weeks and would not dare undermine the democratic demands of millions of fellow citizens. They may very well be correct that the army can become a democratic force despite serving as the pillar of a non-democratic system for the last 60 years. There is great hope that the political dynamics in Egypt have now changed in such profound ways that it would be impossible for the military to do anything but help midwife Egyptian democracy. Observers can only step back and hope that Egyptians are correct.